Stephen Kiprotich is a determined man, as would be expected of the 2012 Olympic gold medallist and the World Marathon champion the following year. That is why he will return to the Haspa Marathon Hamburg on April 29 in search of the victory which eluded the Ugandan record holder last year. Kiprotich finished second in the 2017 edition, beaten in a sprint finish by the Ethiopian Tsegaye Mekonnen. 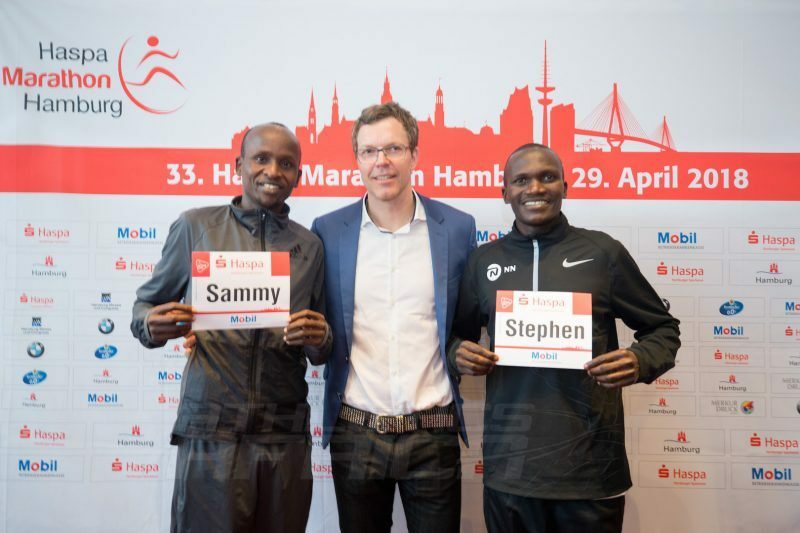 Among his rivals for the latest edition of Germany’s biggest spring marathon will be the Kenyan Sammy Kitwara, whose best of 2:04:28 when taking second place in Chicago in 2014 will also make him a strong contender. “We have 14,250 runners entered which is about at the same level as last year. In conjunction with the Haspa relay and Haspa Half Marathon which are both fully booked and with the ‘One-Tenth Race’ (4.2195km) likely to be full very shortly, these are all very good signs. "What we need now would be ideal weather conditions as we had them last back in 2013,” explained the chief organiser Frank Thaleiser at a press conference in the Radisson Blu Hotel in Hamburg. The 28-year-old has good memories of his race in Hamburg last year, despite the conditions. His second place in 2:07:31 was only five seconds behind the winner. Stephen Kiprotich’s personal best stands at 2:06:33. “Last year the weather conditions with hail storms and the cold were dreadful but, on the other hand, the service provided for us athletes and the enthusiasm of the spectators was absolutely first class and very welcoming. "That’s why I’m very happy to be returning and want to improve on what I did last year, ” Kiprotich added. This will be only the third occasion that a men’s Olympic champion has competed in the elite field of a German city marathon. Kiprotich was the man who began the sequence with his run in Hamburg a year ago, then the 2016 Olympic gold medallist Eliud Kipchoge of Kenya ran in Berlin in September. There is also a link between Kipchoge and Hamburg since he remains the course record holder, having run 2:05:31 in his debut at the distance in 2013. The organisers are hoping for a fast race if conditions are suitable on April 29. “After five years the time is ripe for 'another Eliud Kipchoge' to follow the blue line,” said Frank Thaleiser. If another runner plans to emulate the Kenyan Olympic star, it could be Sammy Kitwara who will be running in Hamburg for the first time. "If the conditions are good, I’ll try to beat my personal best,” promised the Kenyan, whose 2:04:28 in Chicago has stood for four years. Last November he won the Valencia title with 2:05:15, the second fastest time in a career which includes five performances under 2:06.